Objective and efficient instead of subjective and laborious – an innovative collaborative project from the German federal state of Saxony Anhalt could revolutionise plant breeding: scientists from the Fraunhofer Institute for Factory Operation and Automation (IFF) in Magdeburg, with their partners, the company Strube Research GmbH & Co. KG in Schlanstedt and the Leibniz Institute for Plant Genetics and Crop Plant Research (IPK) in Gatersleben, have been developing the hyperspectral measuring method for detecting leaf diseases in sugar beets more quickly and accelerating the selection of plants and their breeding. New resistant and at the same time high-yield strains are a stabilising factor for farmers and sugar factories on a turbulent future sugar market in the absence of quotas and price guarantees. The collaborative project for the development of the new technology, a combination of automated image acquisition and automated analysis, is being funded by the Federal Ministry of Food and Agriculture and by the Agency for Renewable Resources. Project Manager Dr. Andreas Backhaus of the Fraunhofer-IFF places leaves of sugar beet plants on sample bowls and positions them on a moving table. The test objects are linearly moved on this and scanned line by line by the two hyperspectral cameras installed above it. While one camera shows wavelengths that can also be perceived by the human eye, the second camera scans the infrared range. The background is then separated from the leaf. Once this has been calculated, the system recognises the following leaves itself. 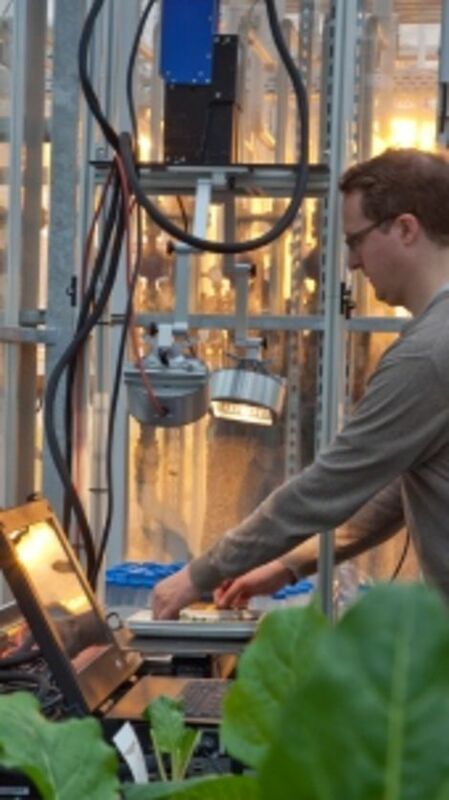 The cameras already detect differences between the leaves of healthy and sick plants from the 3rd day, after test plants have been exposed to the pathogens. The first disease patterns are not visible to the human eye until substantially later. “With the hyperspectral system we hope to be able to measure resistance performance considerably before the forming of visible symptoms, even during the incubation period. The advantage of this would be not just a higher throughput, but also an objective measuring method that would be independent of the persons involved”, emphasises Dr. Jessica Knüfer, scientific employee of Strube Research GmbH. Each day counts, because the cultivators only have about 14 weeks from receiving the seeds until the selection before Christmas. All plants that have not been processed by then cannot be used for selection and utilisation in the following year. A more objective process could also increase selection certainty. In the future market of bio-economy, the scientists will not only be influencing plant breeding with their development of the hyperspectral measuring method, but agriculture as well. On sugar beet fields, dryness, wetness and extreme jumps in the weather in the course of climate change are promoting the spread of some leaf diseases that can lead to substantial harvest losses when untreated. High-yield, resistant strains will be an advantage in the increasingly tough competition, especially after the discontinuation of beet quotas and minimum prices in 2017. They will increase efficiency on the field, save resources and be more environmentally friendly, if spraying against leaf diseases can be done without. Beet growers and sugar factories are also focussing on customer proximity, raw material cycles and the maximum utilisation of the whole plant for the plant, tank and trough. For example, beet pellets from sugar production are used as animal feed and digestates from biogas production are being added to field soil as fertilisers. In addition to this, sugar is not only a foodstuff, but also an industrial raw material which is used in, for example, the pharmaceuticals industry and the production of cosmetics and plastics. The prototype of the hyperspectral measuring method used for the research is, however, expensive. In order to come up with a solution that is affordable and efficient for medium-sized companies, the next step is to find out in which wavelength ranges the relevant information lies − i.e. the spectra that the cameras actually have to cover − and what camera quality is necessary. Then the technology could also be used on other crops such as maize or potatoes, “for that the system would just have to relearn with the appropriate data”, says Andreas Backhaus.